Local 447-704 assists potential live music purchasers in the Southeast Georgia and Coastal Carolina area to find the right artist or group for their party, wedding, festival, corporate function, or any other event that requires live music. In addition, the AFM provides an international on-line referral service – free of charge to all members and potential purchasers – that is quickly becoming one of the largest Internet resources of its kind. The AFM maintains an on-line list of franchised booking agents for the US and Canada. It is also available in booklet form by contacting Local 447-704 or the AFM. These agents are signatories to the AFM’s Booking Agent Agreement which sets standards for legally enforceable contracts specifying negotiated fees, working conditions, and commissions. International, national and local agreements covering all types of musical work ensure fair and timely payments as well as benefits and royalties(where applicable) for the reuse and new use of music recorded under these agreements. In the event a purchaser defaults on payment to members for a contracted engagement, Local 447-704 and/or the AFM will work to resolve the dispute between the parties administratively. Should this prove unsuccessful, Local 447-704 will pay members scale wages for the engagement and the Local and/or Federation will pursue the claim through a variety of legal methods. 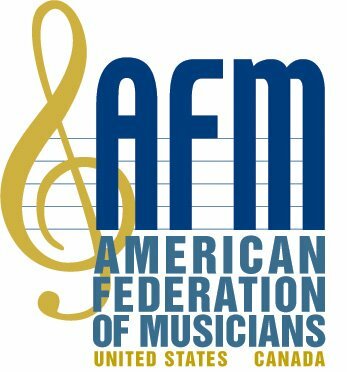 The AFM is an international union representing professional musicians in both the United States and Canada. On behalf of its members who accept gigs across the border, the Federation works with the governments of both countries to cut through the hassle of “red tape” usually associated with obtaining work visas in either location. This assistance is available for both US and Canadian musicians. There are specialized Canadian and US forms, with both formats conforming to the laws of the individual countries, easy to complete, and providing comprehensive legal protection for either single engagement or touring dates. The A.F.M. Mastercard offers special rates, travel insurance benefits, and a special payment provision. Contact the Local 447-704 office for details. The AFM is actively involved at the national, state, and local levels, advocating and lobbying for legislation that benefits the lives of working musicians, including public funding for the arts. Only you know the value of your instruments and equipment. Just think of the amount of money it would take to replace them. Most homeowner’s and renter’s insurance is not enough to protect you from loss, theft, or damage on location. The AFM provides access to an “All-Risk” Musical Instrument and Equipment Insurance Plan. Your instruments and music-related equipment are protected from vandalism, breakage, water, fire, lightning, and theft – up to the full replacement value. If you are employed full-time, freelance, work out of your home, or are self-employed, this insurance protects the large investment you’ve made in your equipment. It is only through the combined efforts of members that Local 447-704 and the AFM are able to better the position of musicians in our society. As a collective unit, we not only have a strong voice in collective bargaining and government lobbying, but anywhere that musicians work. As a member, you will have a voice in deciding our collective future. AFM Local 447-704 continues to be an effective advocate for musicians’ rights in the workplace – be that a nightclub, a concert stage, in a recording studio, on tour, or special events.